Today’s selection is a great example of a song that isn’t terribly well known, yet – on the strength of it’s greatness – still managed to get around quite a lot. 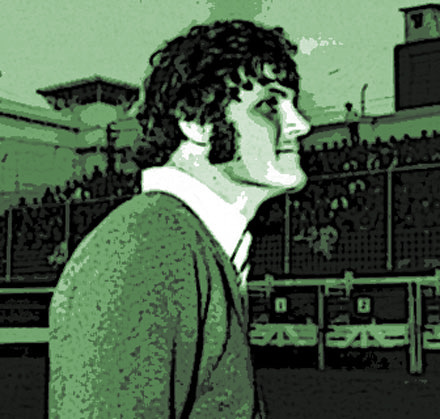 Bruce Johnston is a really interesting, sort of second-level/background musician (not a commentary on the quality of his music, but rather his level of reknown). He got started on the surf music scene in the early 60s, as part of the duo Bruce and Terry (with Terry Melcher), recording one of the really interesting instrumental albums of the early 60s (1963’s ‘Surfin’ Round the World’), joining the Beach Boys and remaining with them to this day, and eventually writing ‘I Write the Songs’ for Barry Manilow. ‘Disney Girls’ (originally ‘Disney Girls (1957)’ ) was first recorded by the Beach Boys on the ‘Surf’s Up’ album in 1971, with a fuller arrangement and lots of classic Beach Boys harmonies. The song went on to be covered by Cass Elliot (in a version with both Johnston and Carl Wilson on backing vocals), Art Garfunkel, Shy, the Captain and Tennille and even Doris Day (who happens to be the mother of Johnston’s old partner Terry Melcher). Johnston released his solo version in 1977 on the b-side of an absolutely execrable disco remake of the Chantays ‘Pipeline’ which really encapsulates everything that was bad about lazy disco cash-in records. That said, Johnston’s version of ‘Disney Girls’ (which appeared on his 1977 ‘Going Public’ LP, produced by Gary Usher) is every bit as a sublime and lovely as ‘Pipeline’ is offensive. 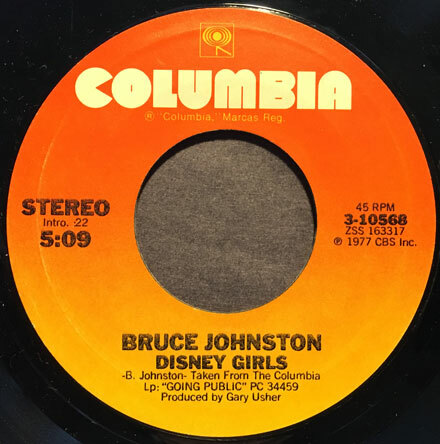 Delivered by Johnston, with only his piano (and occasionally background singers, of which Curt Boettcher was one) for backing, ‘Disney Girls’ reveals itself as a wonder of stunning, sometimes surprising chord changes. The lyrics are a genuinely sweet ode to nostalgia, sounding like an older person wrapping themselves in the warmth of their memories. I think of all the versions I’ve heard, Johnston’s solo is still my favorite. I have something very cool for you to celebrate Christmas this year. ‘The Coldest Night of the Year’ is – like ‘Baby It’s Cold Outside’ (kind of the other side of this particular coin) is more specifically a ‘winter’ song, but has become associated with Christmas since it was first recorded in 1965. Contrary to what you might have heard over the years, the original version wasn’t recorded by Twice as Much with Vashti Bunyan (whose version is quite good) but by Nino Tempo and April Stevens. I have been in the midst of a major rediscovery/exploration of the Nino & April catalog (expect a special edition of the Iron Leg Radio Show), and one of the things I discovered was their version of the song. 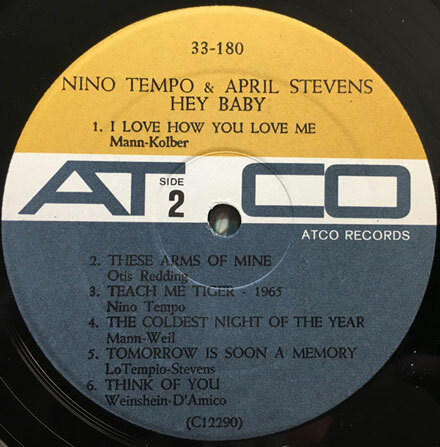 Written by Barry Mann and Cynthia Weil, ‘The Coldest Night of the Year’ was recorded by Nino and April for their 1965 ‘Hey Baby’ album. At the time, they were under contract to Atco, and while they were still having some small amount of success, their last big hit was ‘Stardust’ in 1964, and they wouldn’t hit big again until ‘All Strung Out’ in 1966. Their contract with Atco was running out, and though the ‘Hey Baby’ album is excellent, thanks to Tempo’s knack for experimentation and studio skill and the duo’s harmonies, it wasn’t promoted and sank without much notice (which is why it tends to be fairly expensive and hard to find these days). Their version of ‘The Coldest Night of the Year’ is a gentle slice of folk pop with a chorus that builds nicely. It never attains the Wall of Sound heights that Tempo was capable of, but it is a pretty song, performed with subtlety. Bunyan would record the song in 1968 with the duo Twice as Much, and it was done again this year by Zooey Deschanel and M. Ward under their ‘She and Him’ guises. It’s a groovy song, and I’ll be back sometime in the new year with a comprehensive look and Nino and April. 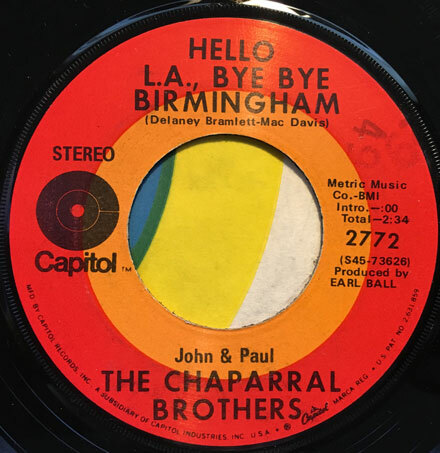 Though I have never been able to ascertain who recorded the first version of ‘Hello LA Bye Bye Birmingham’, the song, written by Delaney Bramlett and Mac Davis, was recorded a bunch of times by folks like Kin Vassy (my fave), The First Edition (a smoking live version), Artie Christopher, Smokestack Lightnin’, John Randolph Marr, Blue Cheer, the Sensational Alex Harvey Band, Juicy Lucy, and even Nancy Sinatra. Someone (and I can’t remember who, so forgive me) informed me about the version by the Chaparral Brothers, so I went out and found me one on the cheap. I wasn’t originally able to find out much about the duo, other than that their names were John and Paul, and that they recorded two LPs and a bunch of singles for Capitol between 1968 and 1972. 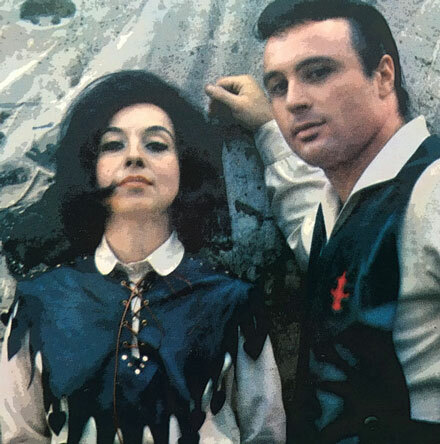 Then, completely by chance I was perusing the very cool Gazzari Dancers website, devoted to the aforementioned troupe, as well as detailed listings of their work on the great mid-60s Hollywood A Go Go dance party show. There, appearing on the 4/3/65 episode (scroll down to episode 15, and make sure to click on the Youtube link) of the show was a duo calling themselves the Jon Paul Twins, with the credits below naming them as Jon and Paul Vorhaben (the writing credits on the Chaparral Brothers original material. 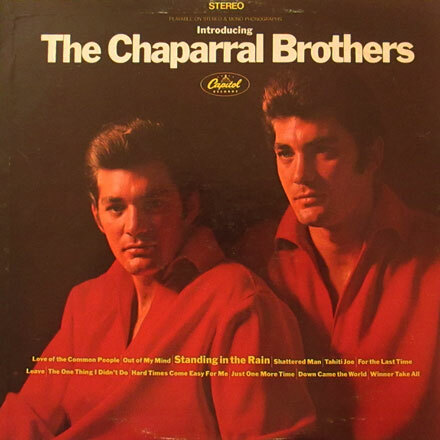 How they transitioned from the Jon Paul Twins to the Chaparral Brothers I do not know, but the evolution in sounds wasn’t that drastic. Their version of ‘Hello LA’ was included on their 1970 LP ‘Just For the Record’. Their sound is pure Bakersfield, which makes sense since they were produced by Earl Ball who also spun the dials for Buck Owens, Merle Haggard and Wynn Stewart. The brothers deliver tight harmonies and it’s kind of a shock that their version – which has a lot of crossover appeal – wasn’t a hit. It could be chocked up to the fact that the market was already flooded with versions of the song, but as far as I can tell this is the only straight country take on the tune. That said, I will certainly be on the lookout for more by the duo. We have a very special episode for you this week (dropping a little early, as well). 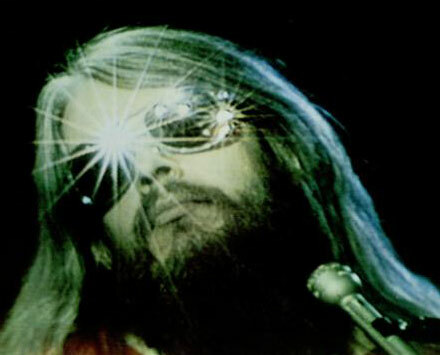 The world recently lost the mighty Leon Russell, a brilliant songwriter, singer and pianist, and a foundational artist in my musical sensibilities. I decided that tribute had to be paid, so this episode is dedicated to Leon as producer, arranger, composer and performing artist. 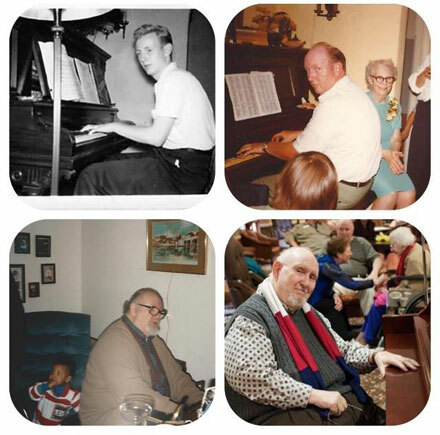 There are some familiar things, some things you may not have heard before, and I close out the show with a cover of one of Leon’s best songs by none other than the man who first brought Leon’s music into our house, close to 45 years ago, my Dad, Joe Grogan. So settle in, with a mug of cocoa to take the chill out of the air (or something stronger if you so desire) and open your ears to some of the finest music of the last 50 years. As always, I hope you dig it, and I’ll see you next week.